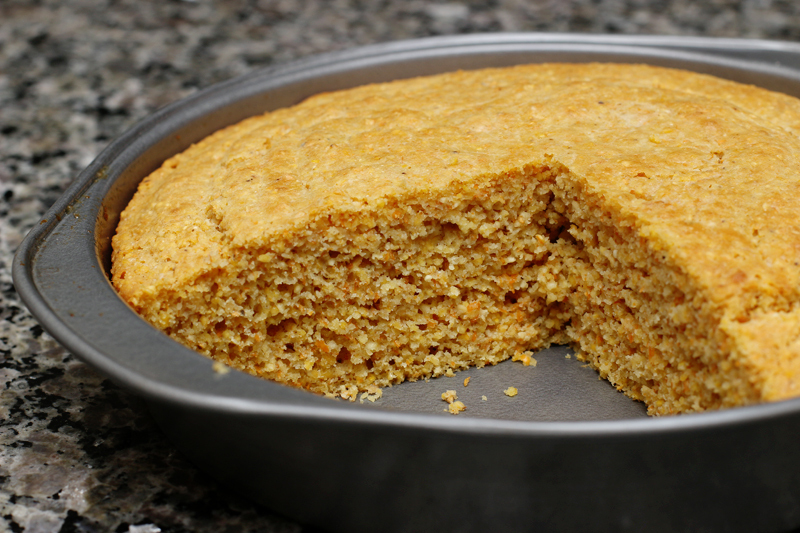 Cornbread has been on my list of recipes to try for years. I'm not sure what got in the way of me making it, because basic cornbread is a relatively simple and straightforward recipe. Perhaps my love for it (and hubby's lack of love for it) made me nervous that I would eat it all in one sitting. I finally tested out a cornbread recipe today to accompany our leftover Instant Pot Chili--ironically, I decided to bake because I was too lazy to pop out for 5 minutes to buy bread. I roughly followed this recipe, but I won't get into the debate about the use of wheat flour and sugar in cornbread. I know cornbread purists may have an issue with this, but I just go with what tastes good. And this does. 2. Mix dry ingredients together in a large bowl. 3. Mix wet ingredients (egg, plain yogurt, and almond milk) together in another bowl. 4. Add wet ingredients to bowl containing dry ingredients and mix until just combined. 5. Melt butter in 8" round cake pan and pour into the large bowl containing the batter. Stir to incorporate the melted butter with the batter. 6. Pour batter into cake pan and bake for 20-25 minutes or until a toothpick inserted into the centre of the cornbread comes out clean. 7. Let rest for 20-30 minutes before slicing into wedges. P.S. I didn't eat it all, although I probably could have. We saved some for tomorrow, and I'll likely gobble up a slice or two for breakfast (warmed up with with a pat of butter mmmmmmm!). I'm eager to experiment with this base recipe, hopefully in the not-so-distant future! Next time, I plan to add cheddar, corn, and jalapeno. I love cornbread! I haven't had it in ages - it's hard to find. Do you think that the recipe would be fine using paper liners in muffin tins (without the butter)? Hi! Yes, I think that would be fine. Perhaps you can try adding 3 more tablespoons of plain yogurt if you are omitting the butter.